This diamond (0.20ct) and pink sapphire (0.30ct) single halo style engagement ring semi mount has one row of pink sapphires that make up the halo around the Oval shaped diamond center stone. It can be made for any shape center stone or with any combination of diamonds, sapphires or other gemstones. This halo style engagement ring semi mount is designed for an Oval shaped diamond. This is the diamond semi mount only. No center diamond is included. Click here to purchase a certified loose diamond centerstone. 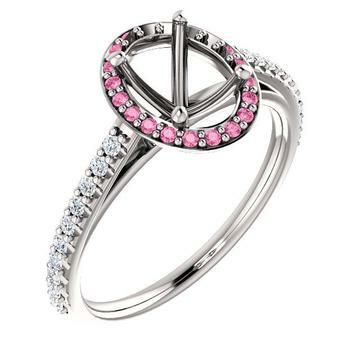 Then select the "set my diamond" option below and we will set your diamond into this setting before we ship it.